Our new shower has been installed and is now in use by clients during drop-in hours. 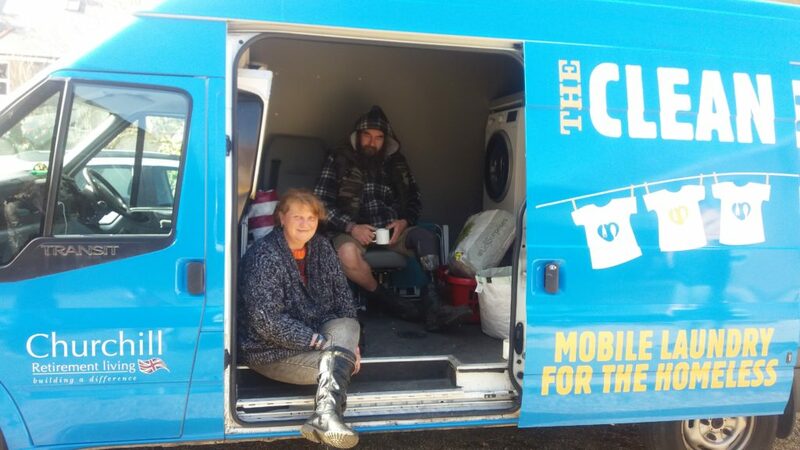 Previously their only access to a shower had been once a week at the Salvation Army, so this new facility is a real godsend. One client commented that he felt like a ‘new man’ and he promptly took advantage of an opportunity to have his hair cut as well. 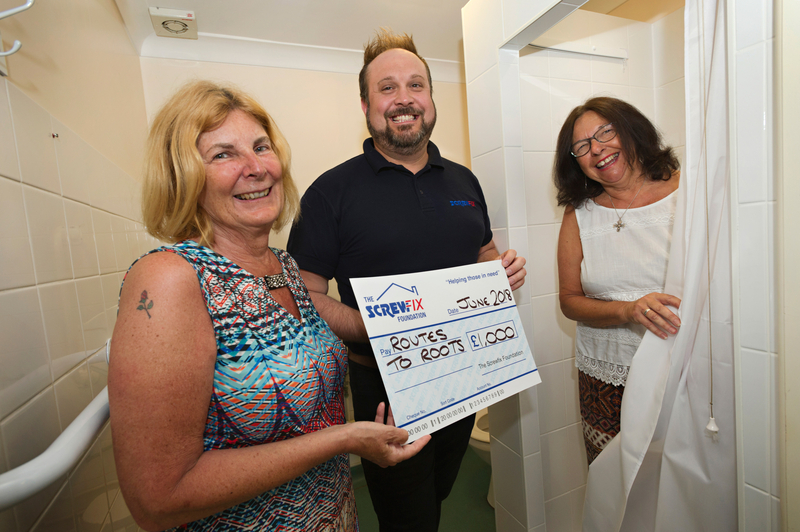 Many thanks to Skinner Street URC for allowing us to install the shower in their hall and to The Screwfix Foundation and Valentine Charitable Trust who provided all the money. Tom Belmont, Manager of Screwfix at Creekmoor, presented Pat and Susan with a cheque for £1000 and took a look at how we have spent Screwfix’s money. Pics by Samantha Cook Photography, 4th June 2018. The Screwfix Foundation donation to Routes to Roots (Poole), Skinner Street URC, Poole, Dorset BH15 1RQ, towards a new shower in the church hall, for use by rough sleepers during drop-in hours. Pic: Screwfix Poole-Creekmoor Store Manager, Tom Belmont, presents cheque to the R2R Team: (right) Chair and Founder Trustee, Revd Pat Southgate, (left) Susan Gittins, Volunteer and R2R Publicity and Fundraising. There are a lot of health problems that are exacerbated by poor dental health eg. heart conditions, diabetes and pneumonia. 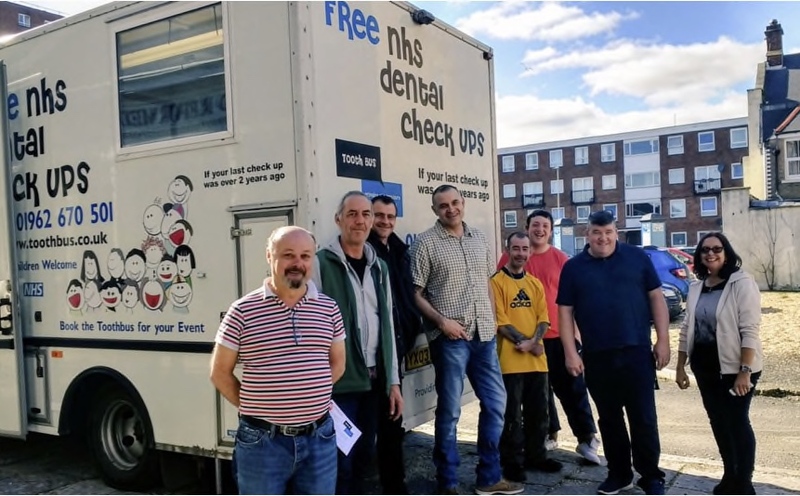 Poor dental health can also affect how someone feels about themselves, so it’s important that everyone has easy access to NHS dental treatment. The Toothbus Manager, Angie Naughton told us: “We’d like to thank Healthwatch Dorset & Routes to Roots for a great afternoon. The dentist saw 10 patients at the event and everyone received details of how to register with a local dentist for ongoing treatment. The Toothbus is available to everyone. It usually parks up in Poole High Street on Mondays and in Boscombe High Street on Fridays. So, if you haven’t seen a dentist in 2 years or more – pop down and see them.